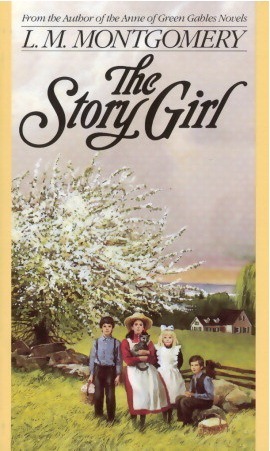 The Story Girl by L.M. Montgomery was one of our three read-alouds for the month of January, which just happened to coincide with the L.M. Montgomery Reading Challenge at Reading to Know. 😉 I chose this as a read-aloud because I wanted to read it myself (I can’t remember if I ever actually finished it in years past) and because I’ve wanted to introduce my girls to L.M. Montgomery, but I’m holding out on Anne. (Discovering Anne was a formative experience for me, and I want to afford my girls the same opportunity, if possible. I’m a great believer in The Right Book at The Right Time.) It turns out that The Story Girl was the perfect introduction. With thirty-one (!) mostly short chapters, it made a perfect bedtime read-aloud. (I really can’t overstate how much short chapters, even if the brevity of them ups the chapter count, means to me at this point in my parenting life!) The fact that the story itself is often humorous was a bonus for us–who wants to go to sleep after reading a heavy story? Of course, Montgomery’s stories aren’t without pathos, but even the more somber happenings and stories that the Story Girl tells are usually tempered by the maturity of the adult narrator by the chapter’s end. Although we haven’t discussed much about the book, I know my girls enjoyed it based on how many times we all laughed aloud during our reading. That’s always a sign of a great read aloud. As for my own feelings about the book–well, what can I say? I look more critically upon Montgomery’s works the more I read and re-read them. That’s not to say I didn’t like this one; on the contrary, I’d have to say that this one rises to somewhere near the top of the heap for me. I love the relationship between all the children in the story–both how realistically it’s portrayed (with all their quarreling and rivalries) and how warm it is. Reading Montgomery always makes me wish I could go back and have a PEI childhood, or at the very least that I could give a PEI childhood to my own children. I found the classism that’s so evident in Felicity’s (as well as the others’) attitude toward Peter Craig both interesting and one of the most obvious examples of foreshadowing I’ve read in a while. 😉 I’m once again flummoxed (and simultaneously amused) by Montgomery’s attitude toward religion in this story. I positively laughed aloud myself at Peter’s quandary over whether to be Methodist or Presbyterian (and I’m neither!) Those who think Montgomery’s tales are “nice little Christian stories” should beware! 😉 I do think Montgomery has as much insight into human nature as any person trained in counseling or psychiatry. It all makes for very entertaining reading, that’s for sure. Even her descriptions, as over-the-top as they are, were welcome to me, and my girls didn’t complain about them, either. I don’t know that this would always be the case, but somehow this book just set right with us this January. We’re going to stop with this one book for now, but I look forward to getting back to Montgomery and The Golden Road next January, if not before. As I turn the pages and glance over the naive records, each one beginning, “Last night I dreamed,” the past comes very, vividly back to me. I see that bowery orchard, shining in memory with a soft glow of beauty–“the light that never was on land or sea,”–where we sat on those September evenings and wrote down our dreams, when the cares of the day were over and there was nothing to interfere with the pleasing thores of composition. Peter–Dan–Felix–Cecily–Felicity–Sara Ray–the Story Girl–they are all around me once more, in the sweet-scented, fading grasses, each with open dream book and pencil in hand, now writing busily, now staring fixedly into space in search of some elusive word or phrase which might best describe the indescribable. I hear their laughing voices, I see their bright, unclouded eyes. In this little, old book, filled with cramped, boyish writing, there is a spell of white magic that sets the years at naught. Beverley King is a boy once more, writing down his dreams in the old King orchard on the homestead hill, blown over by musky winds. I simply cannot end this post without expressing my horror at the cover of the book that I’ve linked to Amazon above. That, my friends, is a travesty of the first order. I’m sharing the cover of the book that I own (and have owned for lo, these last twenty-five years) to give you a much more accurate representation of the spirit of The Story Girl. Thanks for reviewing this new-to-me Montgomery title. I’ve only read the Anne and Emily books. I enjoyed this one when I read it a few years ago. You’re right, readers shouldn’t “assume” these are nice little “Christian” stories. I find Montgomery’s various portrayals of religion to be interesting–the views vary character by character, book by book. Some *seem* a bit more “sound” than others. I have not personally read The Story Girl but my three older girls loved it. I guess I need to read it! Reading your review, I realize how little I remember this book – maybe it’s time for me to re-read.